She came, she spoke and she rocked the house. “It’s great to be here in Indiana, the crossroads of America,” she said to thunderous applause. Palin dedicated most of her speech to the anti-abortion cause and her support of adoption. She became emotional when discussing her son Trig, who has Down syndrome, and the fear and concern she felt during her pregnancy. “I had to call upon my faith and ask that my heart be filled up, and I will tell you, the moment he was born, I knew for sure that my prayer was answered and my heart overflowed with joy,” she said, choking back tears. Watch Palin describe what it’s like raising Trig » Personally and professionally, it’s been a rough road for the governor since the Republican ticket lost in November. Her relationship with Levi Johnston, the father of Palin’s grandson, has been the stuff of soap operas. Her dealings with state lawmakers are not much better. Just before her Indiana appearance, they rejected her nominee for attorney general, Wayne Ross. And as the Legislature wraps up its session this week, Democrats and some Republicans complained the Indiana trip shows the governor is more interested in her national ambitions than state business. The national scene has not been entirely hospitable to Palin either — sometimes in surprising places. “The Tonight Show’s” Jay Leno this week asked Sen. John McCain about people who could lead the Republican Party. McCain, who picked Palin as his No. 2 last year, rattled off a list of names, including Louisiana Gov. Bobby Jindal, Minnesota Gov. Tim Pawlenty, former GOP rival Mitt Romney and others. “There are a lot of governors out there who are young and dynamic,” the senator from Arizona said. McCain then quickly joked, “I’ve left out somebody’s name, and I’m going to hear about it.” Perhaps McCain intentionally left out his former running mate or simply forgot … but even that may be telling. In Republican polls, Palin fares no worse or better than the other GOP names out there. The 2012 race is political light years away, and it is not likely anyone, including Palin, has decided whether to run for president. But she has set up a political action committee. She also took the trek from Alaska to Indiana for a pretty well-covered mini-show that has people parsing her words. “I have a feeling that I’m going to leave here with new energy and with inspiration, and I will restart my engine,” she said. At the very least, she’s interested in laying down a marker. 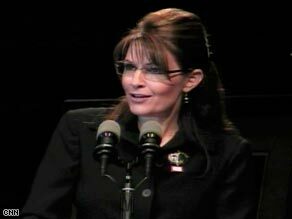 Kurtz: Should media steer clear of Palin-Johnston saga?